Providing your pet with an appropriate habitat requires that you not only understand his or her needs but that you also understand the needs of the other living things kept in their habitats. I’m talking here about the vivarium plants you choose to add. Unfortunately, many keepers struggle to incorporate plants in vivaria. Many keepers wonder how to select the best plants for the enclosure, as well as how to best care for the plants selected. Some also worry about the safety of some plant species. I’ve worked with reptiles and amphibians for nearly 20 years. For about half of this time, I was tasked with designing and maintaining natural-looking vivaria at an environmental education center. I had to learn a lot about using tropical vivarium plants with reptiles and amphibians to do so. And I killed a lot of plants in the process. But, as is often the case, mistakes pave the way for knowledge and growth. So, I’ll try to share some of the most valuable tips and tricks I’ve found for maintaining plants in your pet’s habitat. Later in the article, you’ll find a list of some of the best tropical vivarium plants. Which Live Plants Will Thrive in Your Rainforest Terrarium? Familiarize yourself with hydroponic growing principles. Many vivarium plants can be grown with their roots submerged in water, rather than soil – a practice known as hydroponics. Foregoing soil allows you to install or remove plants more quickly. It also provides more flexibility with regard to placement. Have “backup” plants on hand. Some plants will struggle to thrive when planted in vivaria. Therefore, it is often advisable to have two different sets of plants. One set of plants will be in the habitat at any given point in time, while the others are kept outdoors or in a warm room. This way, you can swap out the plants as those in the vivaria begin to wilt. It will give them a chance to recover and survive for longer. Plants that thrive can quickly outgrow the space allotted and begin taking over the vivarium. This can lead to a host of problems, and it rarely looks attractive. Accordingly, you’ll want to keep a sharp pair of scissors on hand and prune your plants routinely to keep their growth in check. Maintain plants in small containers. While you can plant vivarium plants directly into the soil or substrate in the habitat, you’ll often find it easier to keep them in small pots or containers. They can then be buried flush in the substrate. This will help contain the roots of the growing plant and facilitate installation, removal and replacement. Always wash newly acquired plants. Greenhouses and retailers often spray plants with pesticides, fertilizers and other substances that may harm your pet. Therefore, it is always a good idea to wash off newly purchased plants (gently) before installing them in the habitat. It is also wise to remove any soil, perlite or other materials in which the plant is grown. Scientists estimate that there are nearly 400,000 plant species on Earth, but very few of them will thrive in a tropical terrarium. Many require too much sunlight or grow too large. Others cannot be propagated commercially, and are therefore unavailable to herpetoculturists. Below, we’ve detailed some of the species that are capable of thriving in your lizard, frog or snake habitat. Be sure to consider all of the potential options carefully before making your selections, and follow the basic preparation and care steps discussed above before installing them in your enclosure. The genus Ficus is comprised of about 800 to 900 species of plants that inhabit tropical lands around the world (as well as a few warm temperate locations). Also known as figs, some of the species are important food sources, while others are used as ornamentals. Several Ficus species are useful in tropical vivaria. They typically thrive in low light conditions and are adapted to environments with a high relative humidity. Ficus species exhibit a range of growth habits; some grow as vines, while others grow as shrubs or trees. Those that exhibit a vine-like growth habit typically work best in reptile and amphibian habitats. But the tree- and shrub-like forms can also work if they are kept pruned. Some Ficus plants have toxic leaves, so they shouldn’t be used in tortoise enclosures or those housing plant-eating lizards (including bearded dragons or chameleons). Quick and easy to grow, the ficus pumila will offer nice hides to your dendrobates. Better known as the creeping fig, F. pumila exhibits a trailing growth habit, requires a moist, yet well-drained soil and grows best in well-lit habitats. Although F. benjamina – also known as the weeping fig – is a proper tree, which grows up to 50 feet tall in its natural habitat, it usually remains pretty small indoors. Be careful not to overwater these plants, and provide them with as much light as you can. Colloquially called the rubber plant, F. elastica typically thrives in vivaria, as long as it isn’t forced to grow in poorly drained soil. It usually grows as a single-trunked tree, but it can also exhibit a more shrub-like growth habit. The term “bromeliad” refers to nearly 3,500 species of plant in the family Bromeliaceae. It includes several familiar plants, such as pineapples and Spanish moss. Some bromeliads are terrestrial plants that obtain their water from the soil. But many of the most popular bromeliads among herp keepers are epiphytic bromeliads. They grow high in the canopy and collect rainwater in their urns – a central collection of cup-like leaves. This makes bromeliads very helpful in vivaria, as it means you can tie or glue them to elevated branches. It will give a more natural appearance to your planted vivarium. Most bromeliads are tropical species, which are native to humid forests of North, Central, and South America. They thrive in humid enclosures containing dart frogs, tree snakes and small jungle-dwelling lizards. Among vivarium plants, bromeliads are very helpful and often serve as microhabitats, in which small frogs and other creatures dwell. Like many other “air plants”, T. pseudobaileyi requires relatively little care. An epiphytic species, it is best tied to a piece of driftwood or cork bark, misted once or twice a week, and otherwise left to its own devices. The neoregelia is a bromeliad loved by small frogs and it will thrive in a vivarium. A beautiful and boldly colored bromeliad, Neoregelia species are quite popular among herpetoculturists. Try to provide these plants with as much light as you can and keep their urns about ¼ full and they will usually thrive. Another colorful bromeliad, A. recurvata grows best in bright vivaria, and you must be careful to avoid overwatering it. Be aware that the leaves of this plant often bear sharp spines, so use care when incorporating this species in your enclosures. Ferns are members of an ancient plant lineage, which has been around since before the first dinosaurs walked the planet. They are vascular plants, but unlike many other, more advanced lineages, ferns produce via spores rather than seeds. There are more than 10,000 described species within the fern lineage, and they are found in a variety of habitats. However, most of the species used as vivarium plants inhabit forests. Ferns are fantastic additions to most vivaria. They are hardy and typically thrive in the dim lighting that is common to tropical reptile and amphibian enclosures. Ferns look phenomenal and really provide the jungle aesthetic most herpetoculturists are seeking. Commonly known as the Boston fern, N. exaltata grows very well in most tropical vivaria, just be sure to avoid putting it too close to bright lights or overwatering it. This bird’s nest fern will give a jungle touch to your vivarium. Aslenium nidus, which often goes by the name bird’s nest fern, is a broad-leaved fern that requires a little more light than N. exaltata, but usually grows well in brightly lit vivaria. Also known as the staghorn fern for its unusual-looking leaves, P. bifurcatum grows in the same kinds of conditions that A. nidus does, but it is a little more tolerant of dim light. Approximately 28,000 species of flowering plant belong to the orchid family (known to botanists as the family Orchidaceae). Although they are best known for their beautiful flowers, several species produce relatively inconspicuous, green blooms. Many orchids are somewhat delicate, and they must be provided with very specific conditions to thrive as vivarium plants. However, there are a few species that are relatively easy to maintain in the terrarium. Some orchids grow as terrestrial plants and require soil. Others grow as epiphytes, which means they will be a great addition to branches or walls of moss. Ludisia discolor is a pretty, terrestrial orchid, which produces white to yellow flowers on long stalks. It is one of the easiest orchids to grow, and it thrives in very low light conditions. Sometimes called the pink rock orchid, D. kingianum is usually grown as an epiphyte, and it requires a high humidity and relatively high light levels. Zootrophion dayanum produces very unusual and interesting-looking flowers. It can be grown as a terrestrial plant or an epiphyte, and it requires warm, humid accommodations to thrive. Arums are another name for plants in the family Araceae. A large and diverse family, Araceae is comprised of approximately 3,800 species. They grow throughout the tropical portions of the world, although they exhibit the greatest diversity in the tropics of the New World. Many arums are popular houseplants, and several also thrive in reptile and amphibian habitats. It is important to avoid using them in habitats containing herbivorous or omnivorous species. Many of them contains a big quantity of calcium oxalate crystals, which can cause serious illness. Use arums for habitats containing frogs, snakes or insects that are exclusively carnivorous. Perhaps the most commonly used plant in tropical vivaria, golden pothos, as it is usually called, is not only hardy in low-light conditions, but it can be grown hydroponically if you wish. Often called the heart-leafed philodendron, P. cordatum is similar to, but not as popular as, E. aureum. It grows well in humid and dimly lit environments, so it typically thrives in most tropical vivaria. Philodendron selloum produces large, impressive leaves, so it is best reserved for large habitats. Some people have reported that frequent contact with this plant can irritate the skin, so use it with caution. There are a number of other plants that work well in vivaria, yet don’t fit neatly into the categories listed above. Nevertheless, most of the following species work well in tropical reptile and amphibian habitats, if care is taken to provide the resources and conditions they require. Sometimes known as the inch plant, T. zebrina exhibits a trailing growth habit and grows best in relatively well-lit terrariums. It has very attractive and eye-catching leaves, which makes it a favorite among herpetoculturists. Known as the dwarf umbrella tree, S. arboricola is a hardy plant that requires relatively little maintenance. It does have toxic leaves, so be sure to avoid planting it in habitats with herbivores. Better known by the humorous name mother-in-law’s-tongue, S. trifasciata grows to nearly 4 feet in height when grown outdoors, but it usually remains smaller indoors. The spine at the tip of these plants can be quite sharp, so use it with caution. We hope that you’ve found this article helpful, and have learned a few things that will help you provide your pet with a realistic recreation of a tropical habitat. Just be sure to select plants that will thrive in the dim-lighting and high humidity that characterize most tropical vivaria. You’ll then be able to maintain the plants well so that they will live for years. You may have noticed that we didn’t include any mosses on our list. That’s not because they don’t work well in tropical vivaria. To the contrary, many mosses are fantastic plants for tropical reptile and amphibian enclosures (some even work well in aquatic tanks). Accordingly, we’ll be dedicating a future post exclusively to mosses. 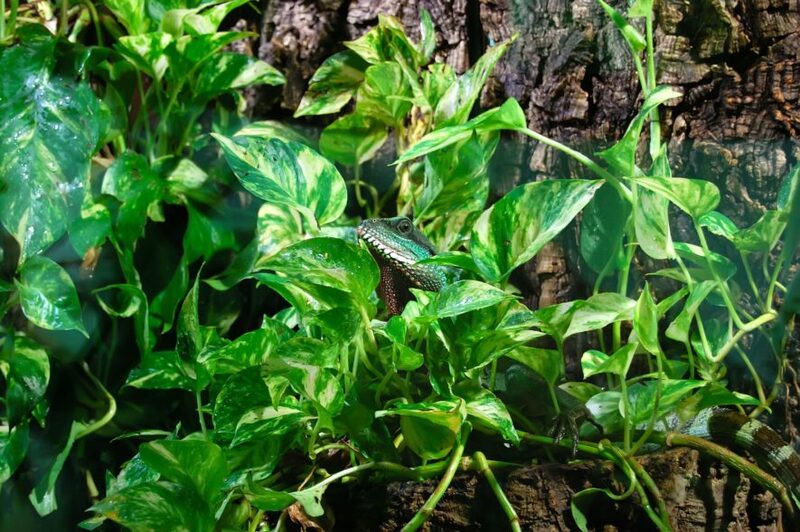 In the meantime, we’d love to hear your experiences with vivarium plants and any questions you may have about them. Just head down to the comment selection below and let us know your thoughts. Also, if you found this article helpful, go ahead and share it with your reptile- and amphibian-keeping friends.